Where can you be in Asia, Africa and Australia in one day? Well of coarse at the Miami Metro Zoo, a world renown zoo. 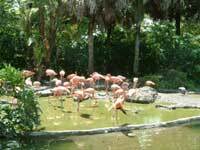 I was at the zoo, on a typical South Florida Summer day, hot in the morning, rainy in the afternoon, and beautiful in the evening. So in order to see all the moods of the animals, you may want to spend the whole day at the zoo. During the midday heat, you may want to visit the Africa section where the monkeys and Gorillas are. They always are very interesting and animated, making lots of noise and movement. In the Chimpanzee and Gorilla section has a great viewing area where you can walk into the animals living area and view them from behind a large plexi-glass window. They are only inches from you. In the Gorilla area, the big guy was laying down with both his big feet lying on the window. You really get to see every detail of this majestic animal and understand the power they have. Especially when they start pounding there feet on the glass. 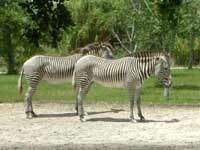 Other animals to visit while in the Africa section of the Zoo are the Zebra, Elephants, Impala and the Ostrich. Here are some interesting facts about Gorillas. Gorillas are only from Africa and ranging from size from 5’ 6” to 5’, about 500 – 300 lbs. They can have an arm span up to 9’ feet long. 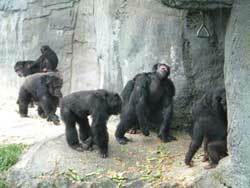 The Gorillas at the Miami Metro zoo had dark black fur with black skin on the chest, palms and face. All Gorillas are quadrupedal, which means they walk on all fours with the soles of their feet flat on the ground and the knuckles on the hands curled and planted on the ground. 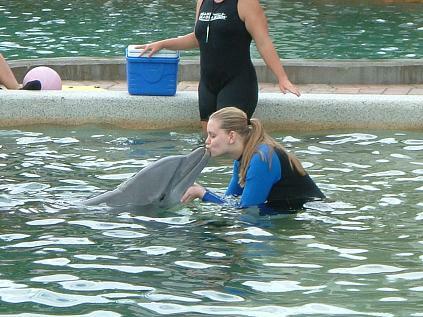 The gestation is usually 8 months and their lifespan is between 30 – 50 years. Gorillas do not drink water. They obtain all the moisture they need from the vast amounts of foliage they consume, about 50 lbs a day. As the heat steams up the skies, the black clouds roll in for the usual afternoon rain showers. So always during the summer months carry an umbrella or portable rain gear. During the rain, the animals become alive. The temperature cools down and the animals are ready to play. During this rainy time go to the Asia section of the Zoo and watch the Bengal Tigers in action. These playful animals are something to see, especially the rare white Bengal tiger the Miami metro zoo has. 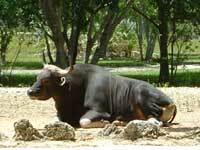 Other animals to see while seeing the tigers are the Komodo Dragon, Himalayan Black Bear, and the Cape Hunting Dog. Interesting facts about the Bengal tiger, they are about 9 feet or 3 meters long, and weighs approximately 400- 569 LB (180-285 kg ). The tigers are solitary animals. The male and female only come together at mating season, when sharing a kill, or when sharing the same watering holes. The litter ranges from one to six cubs, which stay with their mother until their second year. Their diet is varied from deer and cattle to frogs and fish. While they eat a vast range of food, they also eat a lot of food. They can eat up to the equivalent of 100 pounds in one serving! 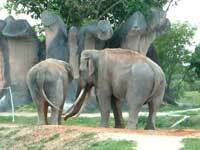 They are usually located on the Mainland of Southeastern Asia and in central and southern India. 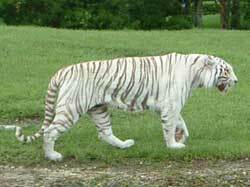 The white Bengal tiger lives in grassy or swampy areas and forests, where they can be well camouflaged. After the rains cooled everything off, the skies were beautiful and blue again, you can finish off the rest of the safari. The final part of the zoo to adventure into is the Australian section of the zoo, where one of the biggest reptiles lives, the Crocodile. Other Australian animals on display are Koala, Tree Kangaroo, Crested Screamer, Giant Land Tortoise, Wart Hog, and of coarse the famous Wallaby. Florida and Australian have one animal in common which is the Crocodile. Here are some facts of these misunderstood reptiles: Crocodiles are reptiles that live both on land and in water. Like other reptiles, they breathe air. Some male crocodiles can live up to 70-100 years old. Crocodiles are “cold-blooded”. To get warm they lie in the sun. To cool down, they lie in the shade with their mouths wide open or laze in the water. To control their body temperature, crocodiles control the blood flow inside their bodies. They can ‘shut down’ blood flow or speed it up. Crocodiles can swim long distances and stay underwater for up to 5 hours. On land, crocodiles can move quickly (up to 80 kilometers per hour) although this is only over short distances as they tire quickly. 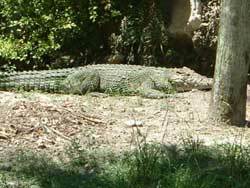 Male crocodiles can weigh over a ton and measure over 16 feet in length. Crocodiles have very good vision, they can see almost 180 degrees but can’t see anything below their nose. A female crocodile will defend its nest to the death from any and all animals. When the mother crocodile hears the babies calling, she runs over to dig them out of the nest. She then carries her babies safely to the water in her mouth. Crocodiles can live for months without eating because they do not use much energy. The Gorilla, Bengal Tiger, and Crocodile are only a few of the animals to learn about. There is so much to learn from each animal at the zoo. The zoo keepers will feed and talk about the Bengal Tiger, Orangutan, Otter, Heerkat, Dramedary Camel, Pygmy Hippo, Chimpanzee/Gorilla, Himalayan Black Bear, Giraffe, African Elephant, Galapagoes Tortoise every day. Make sure to get the times when you enter the Zoo. Finally, the Miami Metro Zoo has plenty of shelters for shade and rain protection, plus nice water mister along the paths to cool you down. Other amenities at the Zoo range from Stroller Rentals, Wheel Chair Rental, Food and Drinks, Birthday Packages, Picnic and Group Gatherings, huge Gift Shop. If you get tired while walking around, you can jump on the Zoo Monorail. It comes in handy to get from one end to other of the Zoo. The park is open all year round and from 9:30am to 5:30pm, the prices are $12 for adults, 13 years and up, children 3 – 12, $7, and less than 3 years old FREE. Call for more information, 305-251-0400. 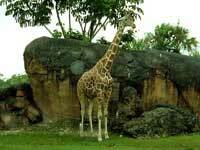 You will have a great day at the Miami Metro Zoo. 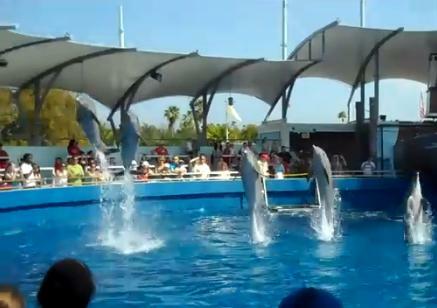 There are many activities to choose from, like swimming with the dolphins in Miami but the Miami Metro Zoo is great choice too.